February Bay Area home sales posted a 6 percent decline from last year, with the largest decreases in San Mateo and Napa counties. But sales of home homes priced between $1 million and $3 million expanded from last February. The overall home sales decline is lower than the average 5 percent annual decline seen over the last four years. Inventory levels are lower than they were in February 2016, with all regions but Alameda County declining by 9 percent, on average. Buyer open-house traffic in Marin County, however, suggests that demand is picking up. The median home price appreciation across the Bay Area increased by 7 percent on an annual basis, with relatively stronger appreciation in Silicon Valley driven by an increase in luxury home sales. Bay Area home sales slowed again in February, falling from both January and last February by about 2 percent. Nevertheless, compared with the monthly and year-over-year changes recorded in recent Februarys, the news is not all bad. While a 2 percent month-over-month decline in February is below the five-year average of a 4 percent increase, it is lower than last February’s 6 percent decline. To recap the initial months of 2016, the volatility that shook the stock market early in the year contributed to a somewhat slower start for the housing market. At the same time, the 2 percent year-over-year decrease in February 2017 is lower than five-year, year-over-year average decline of 5 percent. Generally, the annual February declines recorded over the last four years have been slowing, which suggests a stabilizing market. Also, total sales for the first two months of 2017 are only 1 percentage point lower than during the same period last year, with the lowest price range again showing the largest decline. Sales of homes priced above $1 million are actually 12 percent higher than last year. The reason that the lowest price range is dragging the overall decline is because it still comprises 72 percent of all Bay Area sales, down from 75 percent last February. And while all regions’ share of lowest price range declined from last year, Santa Clara and Alameda counties saw the largest such drops — 6 percent. Among the higher-priced ranges, February sales were 13 percent higher for homes priced between $1 million and $2 million; 28 percent higher for homes priced between $2 million and $3 million; and 13 percent lower for homes priced above $3 million. And while sales in the highest price range fell in February, they were still 10 percent higher year-to-date, with Silicon Valley and San Francisco responsible for most of the increase. Continued inventory declines, down 9 percent from last year, also constrained February sales. Five out of eight Bay Area counties (excluding Solano) had double-digit percent supply declines since last February. Figure 1 illustrates year-over-year changes in home sales and for-sale inventory in February. Alameda is the only county with both improved sales and inventory activity from February 2016, while all others suffered. Santa Clara saw some pickup in home sales, largely stemming from sales of homes priced between $1 million and $2 million. Declining inventory, however, has been an ongoing trend since 2013, with supply conditions of less than two months. As a ratio of for-sale inventory to monthly sales, the months’ supply measure could inaccurately suggest that inventory is growing when in fact sales are falling. Either way, low inventory is unquestionably an issue that seriously impedes future improvement in the Bay Area’s housing market. Figure 2 highlights raw inventory trends by price range over the last two years. And while supply conditions move with seasonal homebuying cycles, there are two things to note. One is a substantial 72 percent decline in inventory between February 2015 and 2016. The second point is that 2016’s decline in inventory started relatively earlier in the year than it did in 2015. Last year, the decline in inventory started in August, while in 2015, it didn’t commence until November. There are a number of reasons for the earlier inventory decline last year, including uncertainty over the presidential election. Nevertheless, due to continuous appreciation, some of the inventory has moved from being priced at below $1 million to between $1 million and $2 million, which is why the chart shows a higher increase in the latter price range last spring and summer. Still, with two price ranges combined, the total inventory has still been continually lower than the prior year, with an average of 5 percent fewer homes for sale over the last six months than during the same period the year before. Source: Terradatum, Inc. from data provided by local MLSes, March 6, 2017. Demand for homes has not waned, though. 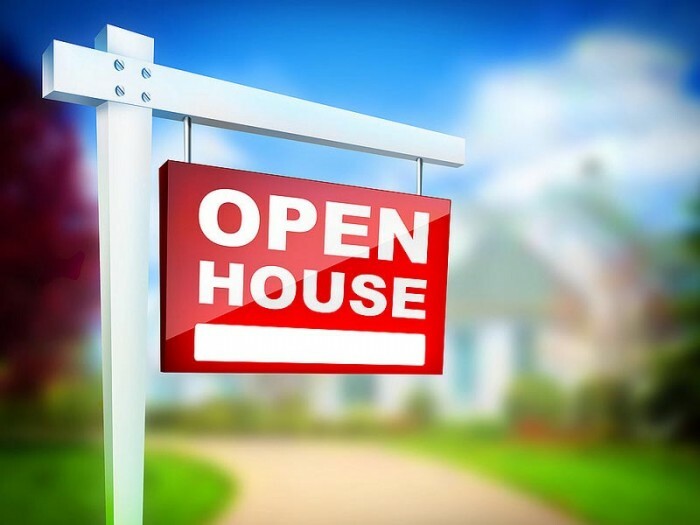 Based on the data Pacific Union collects for open-house traffic in Marin County, the number of real buyers who visited a home increased from an average of about 11 in the third quarter of last year to an average of 18 in the first three months of this year (Figure 3). The first week of March proved particularly strong, with an average of 25 buyers visiting eight open houses. Given the lack of historical trend data on the subject, it is difficult to say whether the March increase is consistent with seasonal patterns, but it is certainly encouraging to see a gain from last summer. Better weather thus far in March may also be contributing to the increase. Home prices also steadily increased across the Bay Area in February, rising by 7 percent year over year, with the largest increases in Silicon Valley: 17 percent in San Mateo County and 12 percent in Santa Clara County. Silicon Valley’s significant median price increase is largely due to a spike in sales of higher-priced homes, those at the $2 million and higher point. 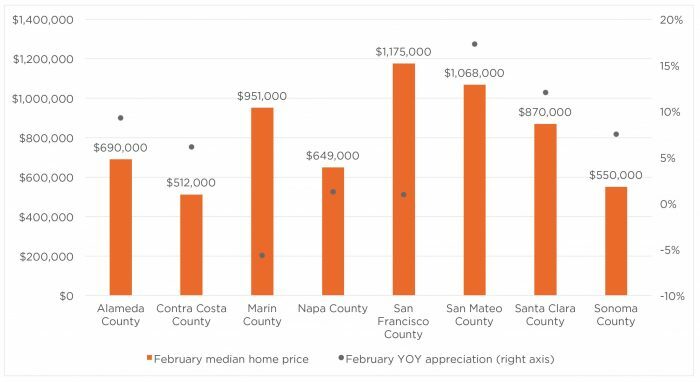 Figure 4 illustrates February median prices by Bay Area county and year-over-year appreciation rates. San Francisco’s high median price continues to weight the overall appreciation rate, while more affordable areas of Contra Costa and Alameda counties are seeing stronger appreciation, an average of 8 percent. Marin County’s median sales price slipped, but again, the drag was driven by a seven-unit decline from last February in sales of homes priced above $3 million. In conclusion, anticipation remains over the impacts of new administration’s policies on the Bay Area’s economy and housing market. 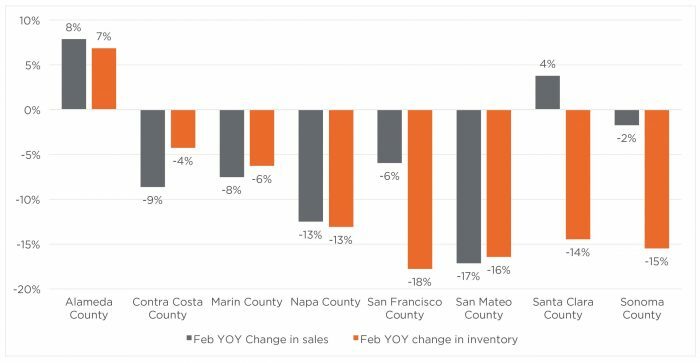 The decline in inventory has to some degree illustrated that Bay Area homeowners have decided to postpone selling their homes until more certainty shakes out. And with less than two months since the inauguration, it may be too early to tell what’s to come. At the very least, the inventory shortage will constrict Bay Area home sales going forward and continue to put pressure on prices. 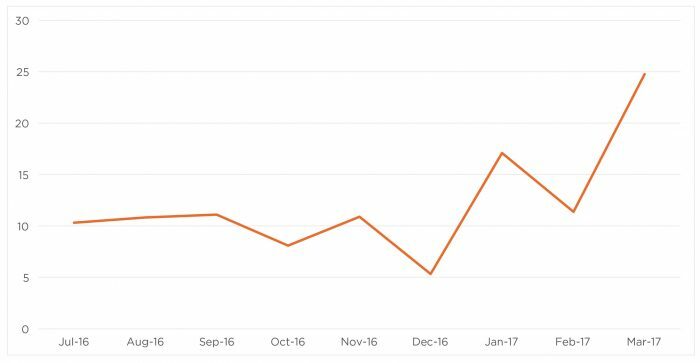 If the increase in homebuyer traffic in Marin County is any indicator of demand, we should be in store for a typically busy spring.